I love making pizza "from scratch" and when you have a great recipe for pizza dough, it makes all the difference in the world. I enjoy making rye bread so I don't mind the waiting and time involved with making breads and bread doughs. You certainly can't be in a hurry if you want to make pizza the right way. This pizza is one of my all time favorites and whenever I have fresh yellow foot chanterelles (Cantharellus tubaeformis) and a good supply of black trumpets (Craterellus cornucopioides) I make it. There is no sauce on this pizza, just caramelized sweet onions, sauteed yellow foot and black trumpets and of course a good amount of freshly grated parmesano Reggiano cheese before baking in a 500 degree oven for 10 minutes and you get one of the most delectable pizzas ever. Pizza is only as good as the dough it's made on and that is why I rarely ever eat pizza that I didn't make myself. This is the best pizza dough recipe I've ever used and you could eat this with nothing on it and it would still be delicious. 1. Put the warm water in a mixing bowl and stir in the yeast, sugar and one cup of the flour. Set aside until foamy, 20-30 minutes. Lightly oil a clean bowl for the dough. 2. Stir in the salt and oil, then start stirring in the flour until the dough is fairly stiff. When too stiff to stir, turn it out onto a lightly floured counter and knead until the dough is smooth and shiny, about 10 minutes. Add more flour as needed. Put the dough in the oiled bowl, turn once to coat, cover with plastic wrap and set aside to rise until doubled in bulk, about an hour. NOTE: I use my Kitchen Aid mixer to make the dough. I use the mixing bowl in the first step and then using the paddle blade I mix in the flour later switching to the kneading hook and let the mixer knead the dough for me for 10 minutes. I also use a pizza stone to bake on in the oven and preheat to 500 degrees. The pizza only takes 10 minutes at 500 for the bottom of the crust to be a nice toasted brown and some color on the edges as well as the cheese melted in the center. I've just recently relocated to Oregon hence the long silence and lack of activity here on my blog. Things are getting a little more settled now so perhaps I'll have more time to spend here posting new and interesting things. I'm now fortunate enough to be in the most diverse fungal playground in the land. Not only is Oregon loaded with a plethora of wild gourmet edible mushrooms, but there are so many other wonderful foods available for foraging such as razor clams, dungeness crabs, oysters, fiddlehead ferns, sorrel and a host of other delicious things. Since my arrival here I've been concentrating on fungal delicacies such as porcini, chanterelles, shrimp Russulas and whatever else I can find that is food worthy for the table. I've been having fun photographing a variety of mushrooms as well. This winter I'm hoping to scope out the best spots for fly fishing for shad on the Umpqua River for this spring when the run begins but I may also get some time in with some winter steelhead fishing. 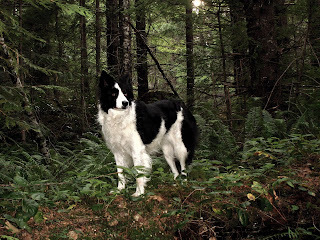 My other winter "business at hand" will be truffle hunting for the elusive Tuber oregonense (Oregon winter white truffle) and Leucangium carthusianum (Oregon black truffle). You may recall my earlier posts when I was in Oregon digging Oregon spring truffles, Tuber gibbosum. Those will come along in May and June but for now it's winter truffle season and I'd be interested in training my companion Maggie to help me find these delicacies in the woods. I've recently moved from SW Montana to the mushroom thick world of Oregon. I've felt somewhat mushroom deprived in Montana, not that we don't have mushrooms but we didn't have the shear varieties of mushrooms out there that the Pacific Northwest has on offer. I've been craving chanterelles for years since moving from Seattle and now I'm in the thick of them. In Montana I had all the morels and Boletus edulis I could ever want and to some extent, had them all to myself. Now I'm in the holy land so to speak and I have a plethora of wild mushrooms and certainly many are wild gourmet edibles, but I surely don't have them all to myself anymore. I'm in an adjustment phase as I'm coming from ten years living in Montana, a very dry climate, and now I'm finding myself in a very damp climate and even though the thermometer says it's not cold outside, my body says otherwise. I have awful joints (knees in particular) and this weather is wreaking havock on my body. But, I'm willing to overlook the physical nuisances for the bountiful harvests I've been having every time I go out foraging in the woods.